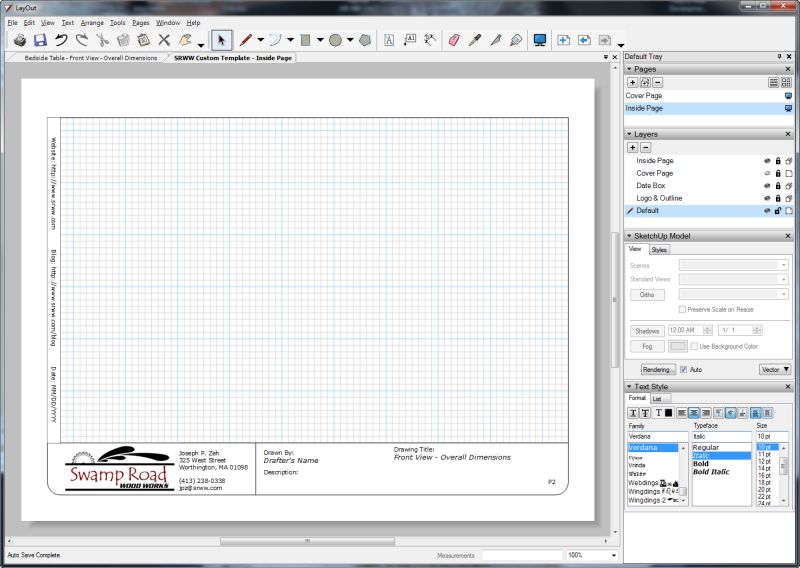 In this post we will complete the template we started in Creating A Custom Shop Drawing Template With LayOut 2 – Part 1 of 2. If you haven’t read that post please do so before reading any further. Hopefully you saved your .layout file from part 1, but if you didn’t you can download mine and pick up from there. When we left off our template looked as the picture at left. Everything we had drawn resides on layer Logo & Outline which is visible on all pages and locked to protect it from changes. Now we are going to create a Date Box layer. This layer will contain the date the drawing set was completed and my website and blog addresses. It also will appear on every page. Add this layer by clicking on the + symbol in the Layers dialog box. Layer 3 appears and is selected. Notice it is unlocked and has one sheet of paper in the Pages icon. Click the Pages icon to change it to four sheets of paper (appears on all pages). Make sure the Visible eye icon is dark (not grayed out). Do not lock it at this time. We want to make changes to it which we can do now since it is selected (active). Rename this layer to Date Box by right clicking on the layer name and choose Rename. Leave this layer selected before going any further. In the Text Style dialog box click on the Align Center and Anchor Center icons in the Format tab. For Family, Typeface and Size choose Verdana, Regular and 8 pt. Using the “Text” tool, and with the aid of the grid, click-drag-release a text box with the dimensions 6 1/4” by 1/4”, however, create the box such that the long dimension is in the horizontal direction. Before doing anything else with your mouse, notice the blinking cursor in the box. Type the line of text immediately following this numerical list of instructions into the text box. Do not cut and paste this line of text unless you first paste it into Notepad and re-copy it to remove formatting. You will have to re-choose Align Center and Anchor Center if you do this. Between .com and Blog insert 9 more spaces. Between /blog and Date insert 9 more spaces. This spreads things out using the entire box. Go to the Window/Shape Style menu to open the dialog box. 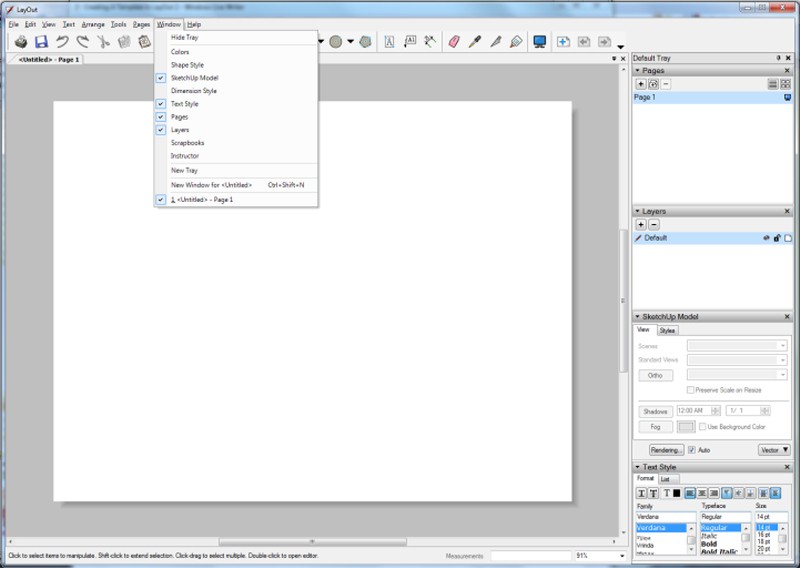 With the text box still selected click on the Fill button in the upper left hand corner of the Shape Style dialog box. The text box should now have a white background (assuming you didn’t change the color in the Fill color box next to the Fill button). Close the Shape Style box. With the “Select” tool deselect and reselect the text box. Hover the cursor over the center of the test box just over the blue dot until you get a rotate cursor as shown in the picture below. Rotate right by click-dragging the cursor approximately 90 degrees. Notice the measurement box at the bottom reads Angle and approximately minus 90 degrees. Release the cursor and type –90 into the Measurements box. The text box now runs vertically in the long axis. Hover over a corner of the selected text box until a curser with four opposing arrows appears and click-drag-release the text box into position. With the “Select” tool deselect the text box. Lock the Date Box layer by clicking on the Lock icon next to the layer’s name. Our template should now look like the picture at right. Notice that the Default layer is now selected and that you cannot change the Date Box text. The only layers that can be selected are unlocked layers. Since the Default layer is the only unlocked layer it is selected. We are now going to customize the Cover Page. The cover page is the page that comes first in a shop drawing set. It informs the reader of the customer or client’s name, the project’s name, the customer or client’s address and provides a short project description. Of course this is all a matter of personal choice, but for the purpose of this tutorial, that is what we will use as the definition of the cover page. Before creating the content of the cover page we need to create a Cover Page layer. Click the + sign in the Layers dialog box and change the name of the layer to Cover Page by right clicking Layer 4 and choosing Rename. Type Cover Page and enter or just bring your cursor to the drawing area. This time leave the Pages icon set to a single page since what we will include on the Cover Page layer will exist only on one page. Using the Text Style dialog box select the first line of text and format it to: Family, Typeface and Size choose Verdana, Regular and 8 pt respectively. Select the second line of text and format it to: Family, Typeface and Size choose Verdana, Italic and 10 pt respectively. This will make the client’s name stand out a little. Your template should look like that at left. We can use the same process to create three more text boxes or use the copy/paste method. If you use the copy/paste method be aware that you may paste the text box exactly on top of the one you copied. That is not a problem; just use the “Select” tool and the opposing four arrow move cursor to move the pasted text box into position. Either type into the text box, or change the text if you used the copy/paste method, such that it looks like that at right. Notice the Prepared For: and Project: text boxes make use of larger italic 10 pt text. The remaining two boxes use regular 8 pt text. Notice that the small red arrow is trying to tell us that one or more of the text boxes runs off the page. The Client Address: is the culprit in this case. I used the copy/paste method to place the text boxes so they are all the same size. Each can be customized based on its needs. Since the Prepared For: text box is never likely to use more than one line I can shorten its height and give that height to the Client Address: text box. The same is true for Project: and Project Description: In addition, Project description may need more width. We make these changes using the “Select” tool and the appropriate cursor to change the size of each box. Try to keep vertical and horizontal alignment of the starting point of each box. To keep the white area of the text boxes from covering part of the Logo & Outline lines you may need to turn off Grid Snap under the Arrange menu. This will allow analog placement of text box edges giving you more control. Turn it back on afterword. Having made these changes the Cover Page information should look like that at left. Lock the Cover Page layer. In the Pages dialog box Page 1 is selected (it is the only page available at this point). Right click on it and choose Rename. Change the name to Cover Page. We now have a cover page template, but we also need and every page template for all the drawings that will go into the drawing set. In the Pages dialog box click the + sign to add a page. It will be named Page 2 by default. We are going to change this name to Inside Page the same way we renamed Page 1 to Cover Page. With that done and Inside Page selected, in the Layers dialog box make the Cover Page invisible by clicking on the eye icon to gray it out (it is not visible anyway because we created it on the Cover Page and made it appear only on that page with the single paper icon selection, but this is a good habit anyway). Format the first line with Veranda Regular 8 pt text and the second line with Verdana Italic 10 pt text. Like before make this text box a little shorter and less tall to make room for other information. Again you may have to turn off Grid Snap under the Arrange menu. Turn it back on when you are done. Lock the Inside Page layer. Now the Default layer is selected as is the Inside Page in the Pages dialog box. What we just did held the assumption that the same person, Drafter’s Name, would draw the entire SketchUp model and create the shop drawings. With that assumption we fixed that information in the Inside Page layer and locked it. To finish our template all we need it drawing title, drawing description and page number text boxes that will change on a page-by-page basis. This information we will put on the Default layer and we will leave it unlocked. Note that the Drawing Title: is pretty specific. That is simply because my custom is to have a front view with overall dimensions as the first page after the cover page (page 2) in all my shop drawing sets. Description: is a place holder; it could be Scale:, or Note: or anything else the drafter desires. Since the Default layer remains unlocked it is changeable at any time. As mentioned, the first page inside the cover page is always P2 in my convention. It too can be changed at any time. There is one last little detail before we can save this file as a template. We added and Inside Page layer and made it appear on all pages, but actually we want it to appear on all pages but the Cover Page. In the Pages dialog box select the Cover Page and make Inside Page layer invisible by graying out the eye icon. Before saving this file let’s be sure everything looks correct. In the picture at the upper right is the completed Cover Page template. Checkout the dialog boxes on the right for content to be sure your setting are the same. Do the same for the completed Inside Page template shown in the upper left picture. If you are satisfied go to the File/Save As Template menu to open the Save As Template dialog box. In the Template Name box give the template a useful name, e.g. SRWW Letter Landscape. 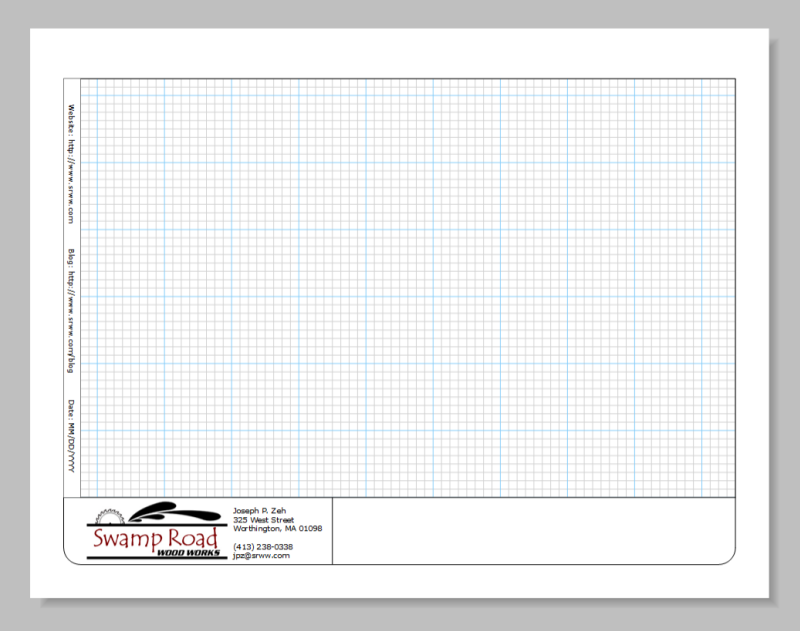 This tells me it is a Swamp Road Wood Works template for 8 1/2” x 11 paper in landscape orientation. If you wish this to be the default template when you open a new file select Default Templates under Template Folder (although there is one more step to make it the default template). To make this the default template, go to File/New From Template to open the Getting Started dialog box. Select your template from the list and check the Always use Selected Template check box. Click Open. A new untitled file is opened and ready to go. If you had trouble along the way you can download my template file and peruse it to see what I did. 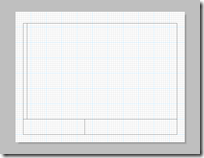 This post completes Creating A Custom Shop Drawing Template With LayOut 2. However, stay tuned for Creating Shop Drawings With LayOut 2, which will explain how to use this template with a SketchUp model to create a shop drawing set. I recently purchased a Google SketchUp Pro license. A major difference between the free version of SketchUp and the Pro version is that LayOut 2 and Style Builder are included in the Pro version. Style Builder is an application that allows you to create your own drawing styles. I haven’t used it, and its not likely I will in the near future. Style Builder seems most suited to architects and marketing types. LayOut 2 is another story. 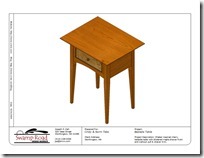 I have used it on a couple of projects to create shop drawings from my SketchUp models. LayOut 2 is a presentation package that can be used stand alone or tightly coupled with SketchUp. 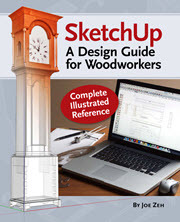 Using it stand alone you have many of the 2D drawing, lettering, labeling and dimensioning features of SketchUp. 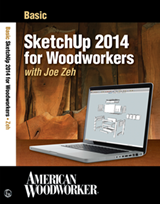 To create shop drawings I use it tightly coupled with SketchUp. In this two part post I will describe how to setup LayOut 2 for this purpose and I will walk us through how I created my own custom template for shop drawings. In subsequent posts I will demonstrate how to create the shop drawings themselves. See the figure above left, which shows a completed shop drawing cover sheet. The template we will create will look like this one. Use this for reference as we proceed. Follow along with me on your own system as we create my custom template. First we need to setup LayOut 2. Open LayOut 2 to a blank page using the File/New menu. In the Window menu select the Pages, Layers, SketchUp Model and Text Style dialog boxes. Click on the picture at right to see an enlargement showing these selections. I use these dialog boxes frequently and leave them open all the time. Notice in the upper right hand corner that these dialog boxes are placed in a Default Tray. LayOut 2 allows you to create a number of trays with different dialog boxes, sort of like a pallet. If you wish you could go to Window/New Tray and open a tray called Tray 1 by default. You can label it anything you want. Check all the dialog boxes that you didn’t include in the Default Tray and choose Add. Now you have two trays that are selectable from tabs along the bottom; the Default Tray contains the dialog boxes you frequently use and Tray 1 has the remaining dialog boxes you seldom use. This may be a handy way to work, but it is all about personal preference. I don’t bother with anything besides the Default Tray. If I want another dialog box I just use the Window menu and temporarily open it in the Default Tray. To define the paper size and orientation use the File/Document Setup menu. This command opens the Document Setup dialog box. and we choose the Paper selection. 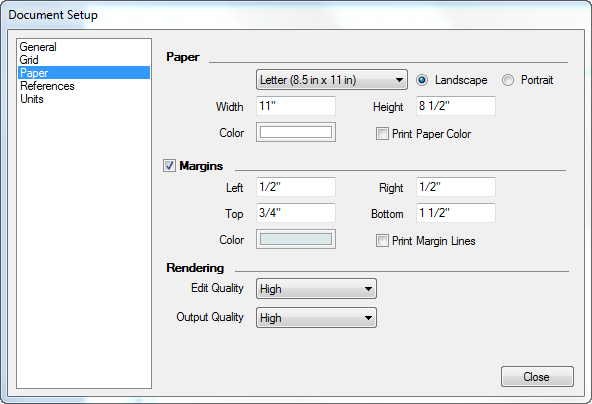 In the Paper section choose Letter (8.5 in x 11 in) from the drop down box and the Landscape radio button. The Print Paper Color check box will remain unchecked. Check the Margins check box, and for Left, Right, Top and Bottom use 1/2”, 1/2”, 3/4” and 1 1/2” respectively. Leave the Print Margin Lines check box unchecked. The Margins Color is Light Gray. In the Rendering section we will select High for both Edit Quality and Output Quality, a personal preference choice. Your dialog box should look as that at left. 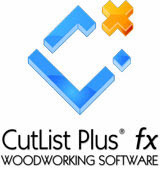 Next we will set up a grid which will aid us in placing SketchUp model scenes on our shop drawings. Using the File/Document Setup menu open the Document Setup dialog box. 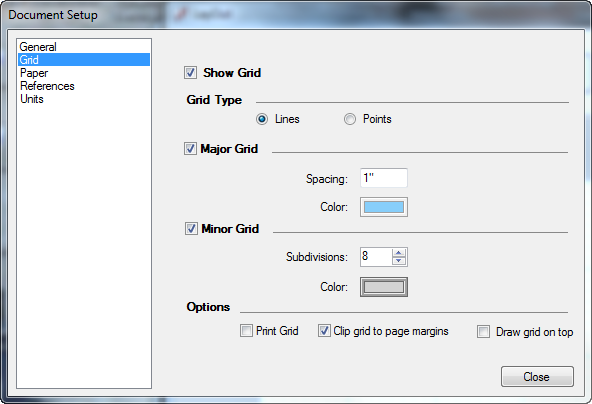 Select the Grid item. Check the Show Grid check box because we want the grid to show on our shop drawing pages as we create them. You can choose between a grid constructed of lines or points; personal preference again, but I suggest we choose the Lines radio button. The grid can have major and minor grid lines with different colors. I am accustomed to one inch major grid lines with eight sub-divisions for the minor grid lines. That provides a 1/8” grid which is appropriate for furniture design in US customary units. If we were drawing in the metric system we might choose one centimeter for the major grid and five for the number of sub-divisions. Check both the Major Grid and Minor Grid check boxes, and enter 1” for the Major Grid and 8 Subdivisions for the Minor Grid. The colors are purely personal choice. I suggest Light Sky Blue for the Major Grid and Light Gray for the Minor Grid. To select a color click on the Color box and the Colors dialog box opens in the Default Tray. There are a number of options for choosing a color. You may use the color wheel, input a color in either RGB (Red, Green, Blue) or HSB (Hue, Saturation, Brightness), choose a gray or color from sliding scales or choose a color from a List. We will sue the latter. After choosing a color close the Colors dialog box to get back to our original dialog box choices for the Default Tray. We will eventually choose the Clip grid to page margins check box, but for now leave it unchecked. Why we do this will become clear later. Leave the Print Grid and Draw grid check boxes unchecked because we don’t want the grid printed when we print our shop drawings, and we don’t want the grid obscuring our drawing while creating it. Click close to save these setup choices. Our blank page is now a sheet of grid paper. Now that we have grid paper to assist us in placing objects, we need to instruct LayOut 2 to use it. Using the Arrange menu click the bottom two menu items until they read Object Snap Off and Grid Snap On. We are now ready to begin drawing our custom template. Use the “Lines” tool (pencil) to draw a rectangle whose sides are 3/4” in from the top and 1/2” in from the sides and bottom. 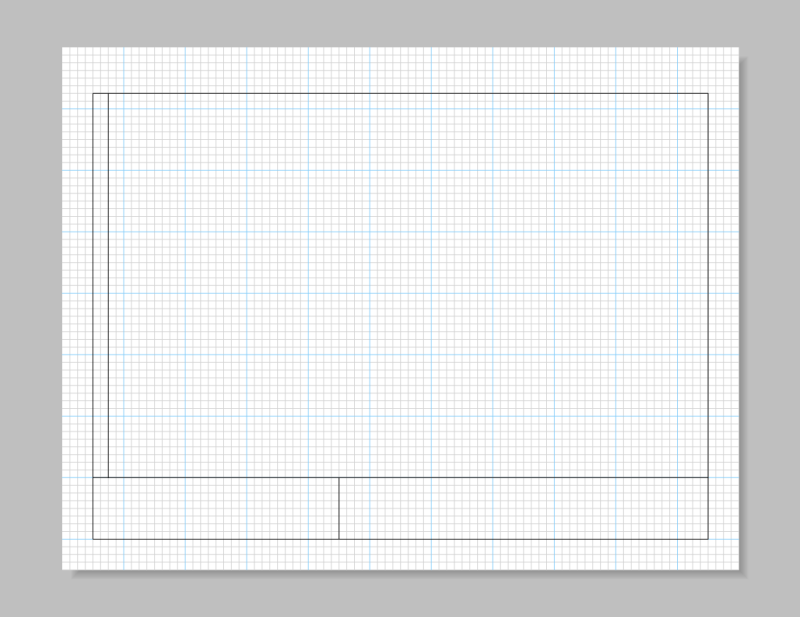 Note we using the “Lines” tool, not the “Rectangle” tool, and we draw individual (separate) lines to create this box. To make each line separate, after drawing each line press the Esc key. 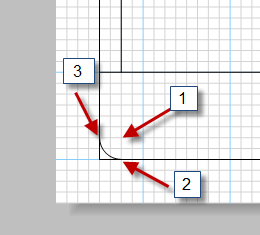 If we didn’t do this, or we were to use the “Rectangle” tool, we would cover my grid with a white face (though I could use the Shape Style dialog box to inhibit this) and the lines would be connected which would cause a problem later when rounding the lower corners. Draw a horizontal line 1 1/2” up from the bottom and stopping 1/2” from each side thereby terminating on the sides of the box we just completed. This creates a box 1” high and 10” long. We now draw a vertical line to sub-divide this box into a 1” by 4” box on the left and a 1” by 6” box on the right. We need one more straight vertical line to complete our boxes. This one will be parallel to the left edge, 1/2” to its right and extend from the top horizontal line to the first horizontal line that is 1 1/2” up from the bottom edge. At this point our rough template should look exactly as the picture above left. To complete the boxes that outline our template we will use the “Arcs” tool to round the bottom two corners. The arc will be one quarter of a circle with a radius of 1/4” (2 grids). Refer to the picture at left. Using the “Arcs” tool click on a grid center point (Point 1). Next click on the 90 degree radius point (Point 2). Lastly click on the second 90 degree radius point (Point 2). Now we have a rounded corner, but still have the original square corners. To fix this we simply select each line, one at a time, with the “Select” tool and move the endpoints back 1/4” (two grid points). After selecting a line with the “Select” tool, hover over an end point until the cursor turns to two opposing arrows. Click and drag the endpoint back 1/4” with the assist of grid snapping. Be careful not to move the entire line but just the endpoints. Now we will place my Swamp Road Wood Works logo (click the hyperlink to download it). With the File/Insert menu open the Open dialog box and locate the logo file you just downloaded. Highlighting it click on Open. The logo now appears in the center of the page and is selected, indicated by the blue bounding box. The logo is too big and in the wrong position, but correcting these problems is easy. Hold the cursor over the logo until you see the cursor change to four opposing arrows. Click and drag the logo and place the upper left corner where it should be (refer to the picture at right below). Next hover with the cursor over the lower right hand corner until the cursor turns to two opposing arrows on a diagonal. Click and drag the corner, but while doing this hold the Shift key down as well. This forces the scaling to be uniform. Place this corner where it belongs. You may need to repeat moving the corners until you get the optimum placement and size. Be sure to use the Shift key to maintain the aspect ratio. While the logo is still selected use the Arrange/Send to Back menu command to place the logo behind the lines we have drawn. This is to ensure the logo doesn’t obscure any of the lines. Getting the spacing right may require tricks like placing a blank line before may name to create a little spacing at the top. Let’s go back to File/Document Setup and choose Grid again. Let’s check the Clip grid to page margins check box as we said we would eventually do. Now we have a page that looks like that at right. So far we have had one page titled Page 1 and one layer called Default. They are shown in the Pages dialog box and Layers dialog box in the Default Tray. We are now going to add a layer called Logo & Outline. First add a layer by clicking the + sign in the Layers dialog box. A new layer is added call Layer 2, and it is selected indicated by the pencil to the left and the blue shading. Right click on Layer 2 and choose Rename. Type Logo & Outline and press Enter. With the Edit/Select All command select all the objects drawn so far. Note this outlines all objects in blue. Right click on any object and choose Move to Current Layer. This places all objects on the Logo & Outline layer. Everything we have drawn so far we will want to appear on every page of our shop drawings. We will never change what we have drawn so far unless my logo changes, I move, get a different telephone number or change my email address. These are all unlikely to happen in any foreseeable future – I hope. To protect this information from change and to force it to appear on every page of the shop drawing we will make it visible, locked and apply to all pages. We do this with the three little icons to the right of the layers name. Click until the little eye is dark (not grayed out), the lock is locked and there are four sheets of paper in the last icon. The eye indicates the layer is visible on the selected page, the locked lock means it can’t be changed and the four sheets indicates it applies to all pages (of course we only have one right now). Now that this layer is locked it can no longer be selected so the selected layer has become the Default layer. To select the Logo & Outline layer again you must first unlock it. Locked layers cannot be selected (active). Before we end Part 1 let me point out a few things. The page margins chosen were designed such that there is room along the top to punch three ring binder holes. The page will be placed in the binder in the portrait position. The grid only appears in the working area (actually it also appears in the little strip in the left, but that will be fixed in the next post). The grid is there to help place objects in the shop drawings by giving us something visual to snap to, but will not be printed with the shop drawings. 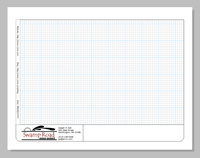 Stay tuned and we will complete the template in Creating A Custom Shop Drawing Template With LayOut 2 – Part 2 of 2. In subsequent posts I will demonstrate how to place the SketchUp drawings in the shop drawing pages for printing.